The Center for Disease Control’s (CDC’s) Second Nutrition Report, an assessment of diet and nutrition in the U.S. population, concludes there are a number of primary specific nutrients lacking in the typical American diet.2 Modern dietary tendencies remain both debatable and problematic, especially considering that processed foods frequently provide sub-optimal nutritional factors, chemical preservatives and artificial food colorings. For some, these are behind systemic sensitivities, allergies and inflammation. Poor digestion. Causes include stomach acid insufficiency and/or poor digestive enzyme production/or stress effects. Food intolerance and allergies. Frequent consumption of irritating foods can lead to allergies. Nutrient deficiency. Causes include sub-optimum intake and/or poor absorption. Toxic overload. An inability to eliminate and excrete various substances can cause this overload. Nutrient deficiencies remain an ambiguous concern among many individuals. 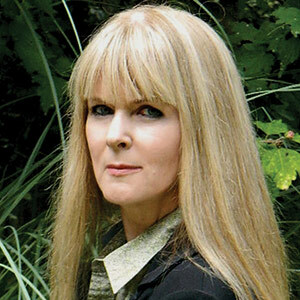 In fact, the notion that they may even occur remains an enigma for some. Unfortunately, the interpretation of “proper nutrition” is itself deficient in many respects, as widespread statistics illustrate. Undetected nutritional deficiencies may also present as asymptomatic; however, these can easily perpetuate to chronic symptoms, and may not present the resultant consequences until they become clinical manifestations. 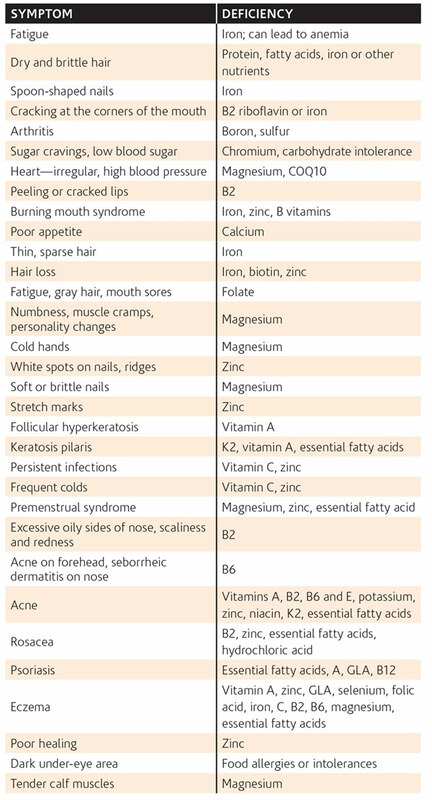 The Nutrient Deficiency Chart3-5 lists several common nutrition deficiency characteristics and the possibly related nutrients.3-5 Note that this information is presented for educational purposes only and does not represent a nutritional recommendation or the identification of a disease or disorder. For the diagnosis of any disease or a nutritional prescription recommendation, please consult a physician. A common doctrine exists among health care professionals: Balance, consistency and quantity ultimately affect one’s nutritional status and state of health. Nutrition is a balancing act, and functional protocols are adapted to suit individual needs based on deficiencies detected though laboratory evaluations, symptoms, age, height, weight, medical conditions and more. Nutritional science includes many facets vital to biochemical and functional processes the body needs to assimilate nutrients. These include bioavailability, malabsorption, diffusion, perfusion and nutrient absorption. Malabsorption in particular is a widespread health condition. This involves the body’s inability to completely absorb nutrients in the small intestines, and it often is concurrent with gastrointestinal conditions. Medications, parasites, viruses, diabetes and other disorders also can affect intestinal absorption. It is estimated that 80% of Americans are deficient in magnesium. Magnesium is the fourth most prevalent mineral found in cells after calcium, phosphorous and potassium. Enzymes critical to the development and repair of DNA require the antioxidant activity of magnesium to carry out their tasks. Also, without the protection of magnesium and other vital antioxidants, the skin is not likely to withstand assault from the most damaging of free radicals. Magnesium is a crucially important mineral for optimal health, performing a wide array of biological functions,6 including but not limited to: activating muscles and nerves; cardiac health; activating adenosine triphosphate (ATP), to create energy in the body; helping to digest proteins, carbohydrates and fats; serving as a building block for RNA and DNA synthesis; and acting as a precursor for neurotransmitters such as serotonin. Bioavailability refers to the transport and delivery of essential materials such as nutrients to the body. Factors affecting bioavailability include the availability, absorption, retention and utilization of nutrients consumed. Largely, bioavailability refers to the proportion of nutrients absorbed from the diet and used in normal body functions;8, 9 e.g., nourishing the skin. Vitamins and minerals vary in size, quantity and function. In relation, nutrients feature active transports or “viaducts” that extrude the vitamin or mineral through the intestinal wall and into the body where they may be directly released or connected to another molecule. Absorption becomes a very specific task, as all nutrient exchanges require a great deal of energy for transport. It is important to note that even when an individual consumes the healthiest and most nutritious foods, if the functioning of their digestive system is faulty or compromised, so too is their ability to absorb and utilize nutrients. Phagocytosis and release of waste products. Nutritional support of the skin is dependent on the following four elements to facilitate and utilize nutrients. Skin immune response and antioxidant potential for free radical protection. Foods containing an abundance of micronutrients are considered nutrient dense. Foods supply calories for energy from carbohydrates, fats and proteins. Micronutrients are obtained from vitamins, minerals and powerful components called phytochemicals or phytonutrients. Phytochemicals supply key compounds that protect against oxidants and combat free radicals. Foods with high nutrient densities are recommended over foods with higher calories, sugar content, bad fats and low nutrient densities. ANDI scores are based on 34 important nutritional parameters and are used to rate foods on a scale of 1-1,000, where the most nutrient-dense, green vegetables such as kale score 1,000. This demonstrates the nutritional value of nutrient-dense foods, compared with processed foods and animal products, which generally have high levels of fat, sodium and carbohydrates. 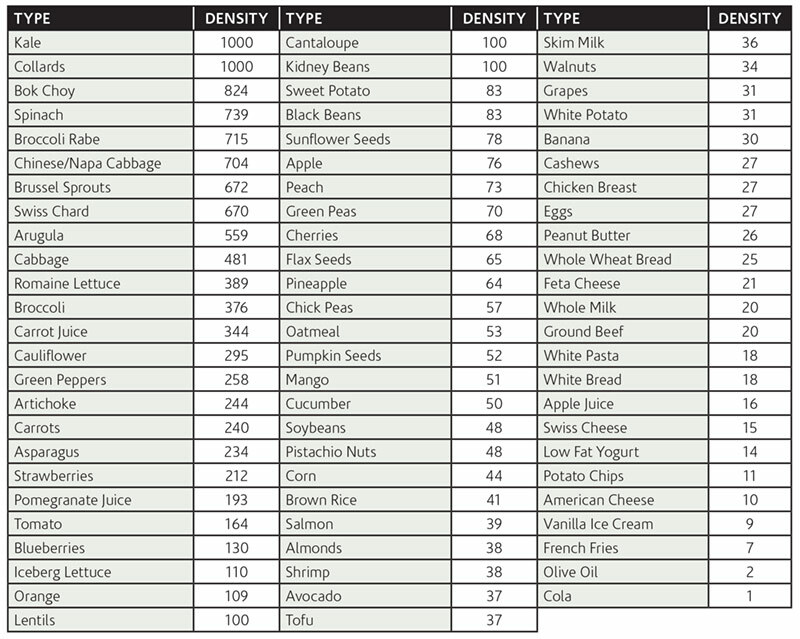 To educate consumers about nutrient-dense foods, health food stores often provide brochures to consumers and even place signs near produce stands rating the particular nutrient density of fresh produce. Phytochemicals are a large group of plant-derived compounds believed to be responsible for much of the disease-protection conferred from diets high in fruits, vegetables, beans, cereals and plant-based beverages. 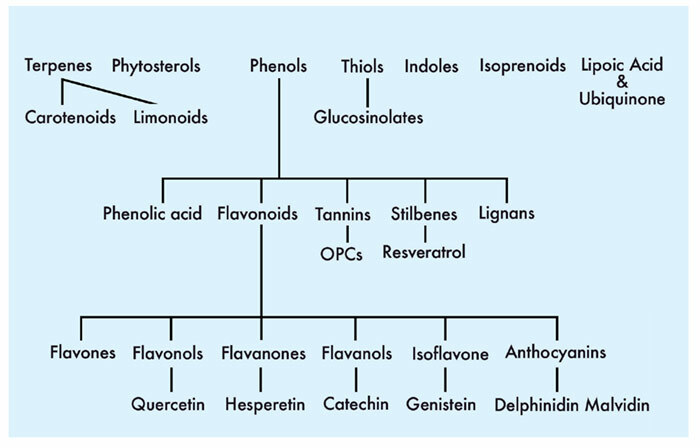 The best known phytonutrients are carotenoids, flavonoids, polyphenols, indoles, lignans and isoflavones (See Phytochemicals). Carotenoids include the yellow, orange and red pigments in fruits and vegetables. Dark, green, leafy vegetables also are rich in the carotenoid beta-carotene, but its usual yellow color is masked by the green chlorophyll pigment. Flavonoids are reddish pigments found in red grape skins and citrus fruits, while polyphenols are found in green tea and berries. Indoles are present in cruciferous vegetables, lignans in flaxseed, and isoflavones in peanuts, lentils, soy and other legumes. As modern dietary tendencies remain both debatable and problematic, it is important to stress the importance of sufficient nutrition to clients. Not only will this impact their overall health, but as the Linus Pauling Institute noted above, it will improve their skin health. With the variety of nutrient-dense foods available, clients have many options to improve their nutrition—allowing nutritionists and doctors to focus instead on questions of bioavailability, allergies, absorption, etc.